Richard Charles Park died November 18, 2018, surrounded by family at his home in Iowa City, Iowa. Mass of Christian Burial will be celebrated at 10:30 AM, Friday, November 23rd at St. Mary’s Catholic Church, Iowa City, with Father Steven Witt officiating. Graveside Services with Military Honors will be held Friday at 2PM at Calvary Cemetery in Victor, Iowa. Visitation will be Wednesday from 4 to 7PM at Lensing Funeral & Cremation Service, Iowa City, where a Vigil Service will be held at 6:30 PM. A luncheon will follow the Funeral Mass. Memorials may be directed to the Regina Foundation. Richard was born October 7, 1922 in Victor, the son of Roy and Elva (Coats) Park. 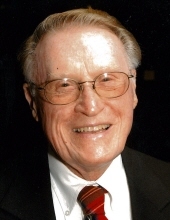 He received his bachelor’s degree in 1944, and his Juris Doctorate in 1947, both from the University of Iowa. Richard served in the US Army as an air cadet during World War II from 1943 to 1944. On September 27, 1947, Richard was united in marrage to Rita Skahill. Their union produced three children: Thomas, Susan, and William. Richard worked as a attorney with Park, Martens and Stiefel Law Firm in Victor. Additionally, Richard worked at McConnell, Park, and Gwin Insurance and he sold real estate in the greater Victor area. After a long and prosperous career, Richard retired in 1988 and moved to Iowa City. On December 28, 1996, Richard married Mary Ann (Thomas) Sladek. The two enjoyed traveling, spending time with their numerous grandchildren, and enjoying their life together on Happiness Hill. Richard was a member of the Noon Lion's Club, the I-Club, and a 50 year member of the Victor American Legion. Richard became a Roman Catholic in 1992, and he was active at St. Thomas More Catholic Church in Iowa City. Richard loved the Hawkeyes and the Chicago Cubs. Richard was also a member of the Iowa State Bar Assn., Sigma Phi Epsilon Fraternity and, Gamma Eta Gamma Legal Fraternity. Richard was preceded in death by his parents, Roy and Elva Park; two infant brothers; Warren and Wayne, his brother-in-law, Frank Koch; and his first wife, Rita Skahill Park. Richard is survived by his devoted wife, Mary Ann; his brother, Raymond Park, and his sister, Janice Koch; his three children Thomas Park (Sandra Champagne) of Morgan, Texas, Susan (Bernie) Nachazel of Cedar Rapids, and William (Wendy) Park of Eugene, OR, grandchildren Doug (Carrie) Park, Emily Johnson (Jamie Kelly), Elizabeth Johnson (Todd Rector), and Katherine Johnson; great-grandchild Mason Park; four step-children and numerous step-grandchildren. To send flowers or a remembrance gift to the family of Richard Charles Park, please visit our Tribute Store. Burial with military honors will follow the luncehon. "Email Address" would like to share the life celebration of Richard Charles Park. Click on the "link" to go to share a favorite memory or leave a condolence message for the family.